Trampoline is pure outdoor fun for kids and adults. They could be a highlight in a party or an interesting toy to get proper exercise for kids in daily life. 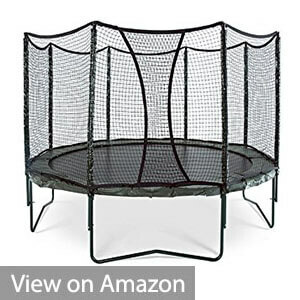 Best trampoline is an undoubtedly ideal household workout set, especially for an extended family with a backyard. 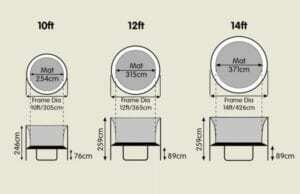 So how to choose a desired and durable trampoline? We know that making a decision about purchasing a large item is never easy. With so many kinds of trampolines available on market and all look alike, customers may get confused with their quality and performance. This guide will round up key product information and list the top 10 trampoline 2019, all for you to get the trampoline that suits best your needs. The NEW AlleyOOP 14′ VariableBounce Trampoline with integrated Safety Enclosure tops our list for good reasons. It is a well-designed commercial-grade trampoline. 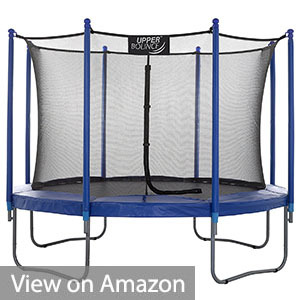 It is built by premium quality materials- heavy-Duty frame made from pre-galvanized steel, 96 extra-stretch high-performance springs, which you can expect to last longer than most trampolines on market. Its manufacturer JumpSport is a professional trampoline supplier with patented VariableBounce technology to help optimize the shock absorption rate and the bounce performance of the trampoline. You may expect the great bounce-after-bounce experience on the NEW AlleyOOP 14′ VariableBounce Trampoline without safety concerns. We are absolutely satisfied with it except for its price tag, but anyway just thinking you are paying $1,500 for a commercial-grade trampoline, still a worthy choice. If you are looking for the first trampoline for kids and toddlers, Little Tikes 7′ Children’s Trampoline is the choice. It comes with ideal size, vivid navy-orange color combo, and a nice castle-style contour. It’s lightweight due to high-performance polythene materials used on the frame, mat, and safety net. With instructions, it only takes 2 adults 30min to set up everything. As a first trampoline recommended for toddlers, Little Tikes 7′ Trampoline is not compromising in quality and safety. 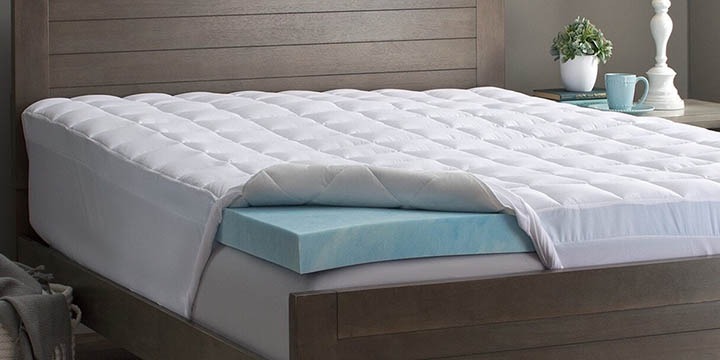 It features durable, high-quality pad protector covers the safety springs, and a frame made of durable blow-molded plastic and high-quality materials. Besides, the shoe storage net design is very considerate detail. 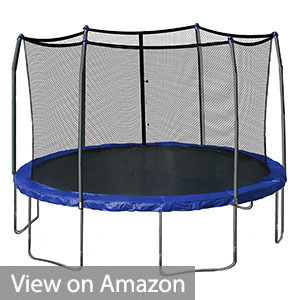 Great price and a perfect trampoline recommended to you. Pole Caps designed with a “C” hook to cover the poles. This enables the Enclosure Net to attach to the poles and stand tall, as well as prevents the net from sliding down the pole. With so many safety features it has to offer, the Upper Bounce Trampoline is surprisingly easy to assemble. It is equipped with the ‘Easy Assemble Feature’, which allows you to handle them within an hour without much effort. It’s an awesome trampoline, safe and well-built. Skywalker Trampolines are a premium and well-received for years. The company is dedicated to building safe and quality trampolines not only for kids but also sturdy enough for adults to enjoy the bouncing fun. The New Skywalker 15-Feet Jump N’ Dunk Trampoline features a soft basketball hoop safe enough for kids yet fun enough for the whole family. It will keep your family safe and entertained for years to come. In addition to the new basketball hoop feature, the 15-Feet Jump N’Dunk trampoline adheres to the consistently high quality by Skywalker Trampolines. It features patented No-Gap Enclosure System, reinforced frame built by galvanized steel T-socket construction, a thick UV-protected spring pad, 96 tightly coiled rust-resistant 6.5-inch springs, and a dual closure system. No doubt it is nice and quality trampoline all-round to enjoy for years. 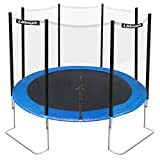 If you are looking for a trampoline that is both in size and weight capacity for a whole family, and in a budget, Exacme 6W Legs Rebounder Trampoline will capture your attention. First, safety always goes first. The trampoline is both TUV, GST and UV certified, meaning reliable and solid quality. It features 6 W-shaped legs with 12 balanced contact points, much more stable and safe than other 4W or 5W legs trampoline. It is sturdy even on the straps, ropes and enclosure net. The frame is strong enough to sustain long-term jumping fun. And it only takes 60min-90min to assemble everything, including a wide ladder. 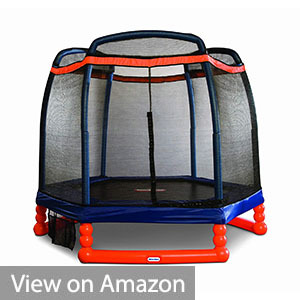 Another thing we love about Exacme 6W Legs Trampoline is the service behind it. The company offers premium service and warranty. You can expect fast delivery of replacement components after, say your trampoline gets damaged in strong winds. It is not easy to get considerate and committed service these days for online buyers. This definitely adds scores to the balance performance of the product. Another Skywalker trampoline in our list. And it’s similar reasons why we love them: good size and quality. The Skywalker Trampolines 15-Feet Round Trampoline is a classical 15ft trampoline model, designed for an extended family to play on for years. It boasts many positive reviews on Amazon, thanks to a very sturdy anti-twisted frame built by reinforced T-sockets and 6 W-shaped legs for added stability. In some reviews, we can tell that such structure can even withstand strong gale in summer and winter (not move an inch!). 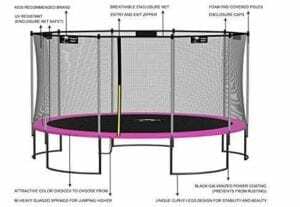 In addition, the Skywalker Trampolines 15-Feet Round Trampoline features a stay-put enclosure net interlocked to the jumping mat without a gap, to create a secure and uni-bodied structure. With such solid structure and all weather resistant materials, you can definitely expect your Skywalker Trampolines 15-Feet Round Trampoline to last for years, keeping your children entertained and active. 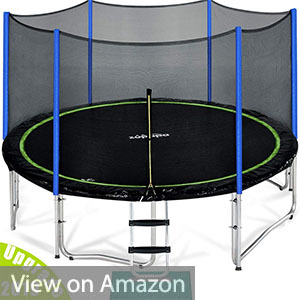 Zupapa 15 14 12 Ft Trampoline series is a TUV approved product and receives most top-score reviews on Amazon. Zupapa earns its premium reputation by using exceedingly high standard components. It uses much longer net poles which are tightly bungled omake trampoline much safer and firm. The Real Heavy-duty steel frame is rust resistant galvanized and much stronger than other trampolines. 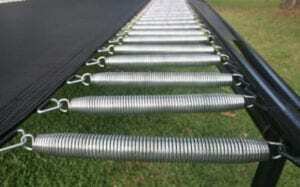 Extra 108 Galvanized Springs (15FT) are adapted to enable Zupapa Trampoline super stretch, comfortable and safe, as well as superior bounce experience. In addition to a high quality body, Zupapa provides an impressive accessories kit including 1 x Trampoline, 1 x Trampoline Safety Pad, 1 x Trampoline Ladder 1 x Trampoline Enclosure net, 1 x Trampoline Rain Cover, and 1 x T-Hook. You won’t miss anything! 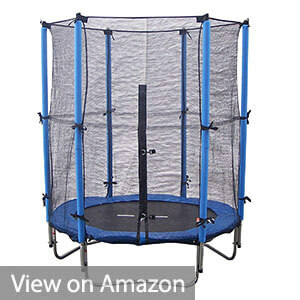 It is a worthy buy if you have super active kids and daily use of trampolines. 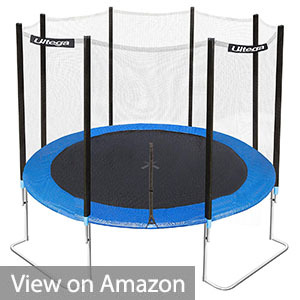 “The latest and safest trampoline in its price group”, this how Ultega Jumper Trampoline professed on their Amazon page. The first thing we know about it is its gentle price tag. The second thing, after some search and study, is its uncompromising quality. Like other listed trampolines, the Ultega Jumper Trampoline is framed by galvanized steel. 6 padded poles deliver the highest level of safety. And a UV-proof mat and net ensure durable and safe bouncing experience. Besides its high price-performance, what we like most about it is the sturdy base. 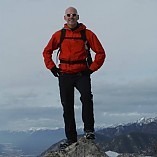 As an outdoor equipment, trampolines will withstand against strong winds in summer, winter and on the beach. The last thing you want is waking up only to find it blown down or away by an overnight hurricane. 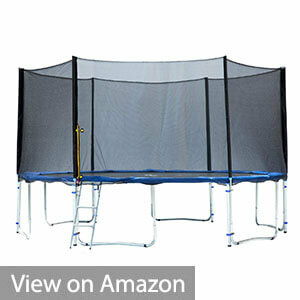 Ultega Jumper Trampoline has a base that prevents the unit from tipping over. It is proven to be very sturdy in terrible weather. 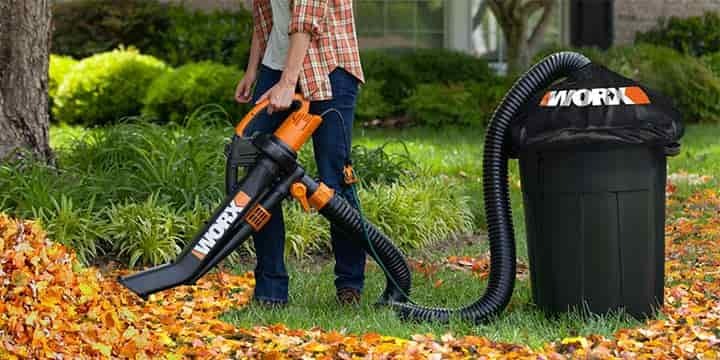 A reassuring investment for windy backyards. The Super Jumper Combo Rebounder Trampoline offers perhaps the widest size range options on the market. 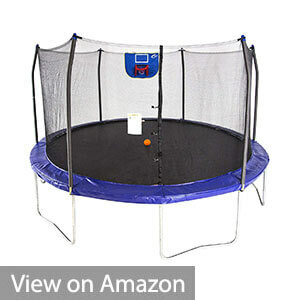 From a 4.5’ indoor use to a 16’ super size, this trampoline could probably satisfy everyone’s need. The TUV certified product has galvanized steel w-frames to provide support and stability, UV coated trampoline mat to prevent sun damage, safety pad to cover the springs and the springs to firmly attach the mat to the trampoline frame. 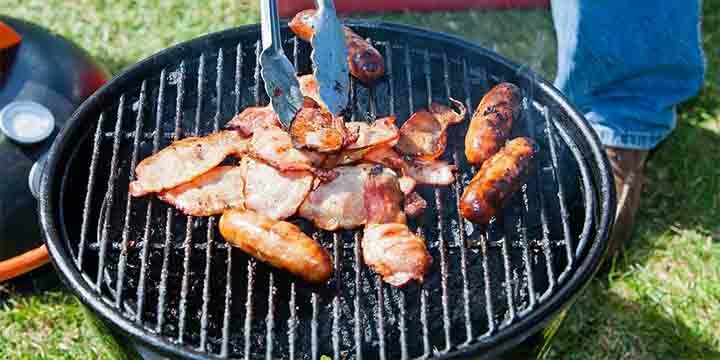 Just put it in one sentence: good quality and easy to assemble. The SKYTRIC Trampoline presents an impressive contour thanks to the “Top Flex Pole Enclosure System”. This design offers amazing stability and durability, which enables the net to stand tall and straight. Another key feature is easy to assemble/disassemble. The SKYTRIC trampoline can easily be taken apart since its poles do not have any hardware so that they can be stored for protection during the winter. 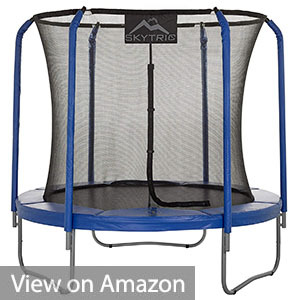 The Skytric Trampolines boast a weight capacity up to 330 pounds thanks to high-quality components and premium design. Plus a second-to-none customer service, it will be a great buy for competitive jumpers aspiring gymnastics as well as family fun for everyone. Generally, trampolines take 2 kinds of shapes: round and rectangular. For home use, round shape is perhaps the most popular. It’s space-saving and safer as the jumpers tend to be pushed to the middle of the mat by circular springs. The rectangular ones are however more common in professional use: like in gym or competitions. Other shapes include square and octagonal. For home use, the trampoline size is perhaps the most important factor. 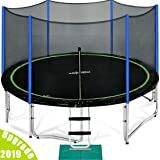 A 7ft trampoline offers enough room for 2-3 kids, a 10ft trampoline can nicely fit 2 additional adults, and a 15ft trampoline will be a decent playground for a 3-3 trampoline basketball game. You need to balance its capacity and footprint to fit in your garden. Trampoline springs decide the weight capacity and durability of a trampoline. Premium trampolines are built by tightly arrayed high-stretch springs, which are antirust. Well, designed trampoline springs and layout also contribute to good bouncing performance. Trampoline weight capacity is a major shopping consideration. 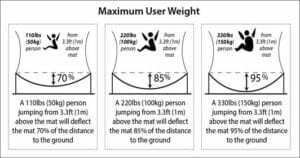 Make a quick evaluation of the total jumpers’ weight, reserve 1-2 jumpers’ weight and you can come up with the trampoline weight capacity that suits your need. Safety always goes first. Most trampolines pack safety features like enclosure net, (double) zippers, safety mat, ladders, covers, anchors. Reinforced frame and the stand is also a reassuring part. Pay special attention to the materials of them: the sturdier, the better. Take care of your trampoline and jumpers, we suggest disassemble and avoid use in winter or strong winds in any case. As an outdoor exercise equipment, trampolines need to be treated with love and care if you would like the fun to last for years in top condition. 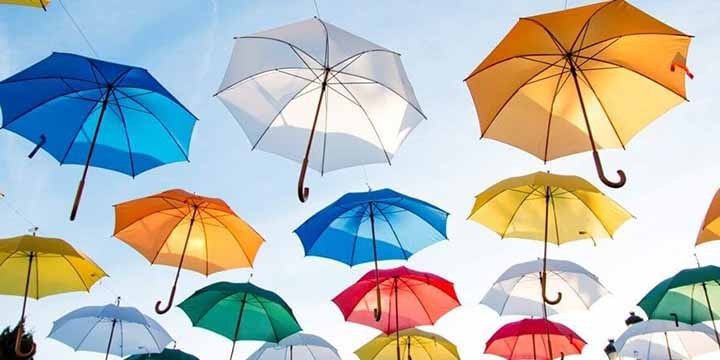 And as a large item and investment, you expect to last for years, you would also prefer timely service support and replacement if it needs maintenance. For this concern, it is important to choose a professional and premium manufacturer with proper warranty and service.